Assigned as part of a skills course associated with the design studio the luminaires seek to introduce the students to digital modeling, digital fabrication and drawing for assembly. 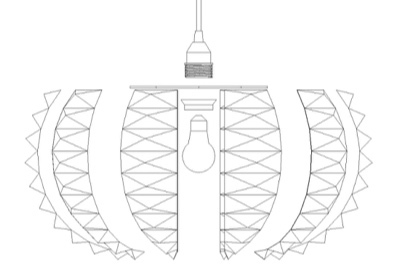 Using a predefined lighting element the students design a series of lamps utilizing fabrication methodologies such as stacking, framing and skinning. These methods allow the students to explore materiality as well as introduces them to digital fabrication techniques in the software, hardware and physical realms. In addition to the fabrication process the students must clearly and concisely explain the assembly process of their luminaires by implementing three-dimensional drawings similar to those of Ikea Corporation.